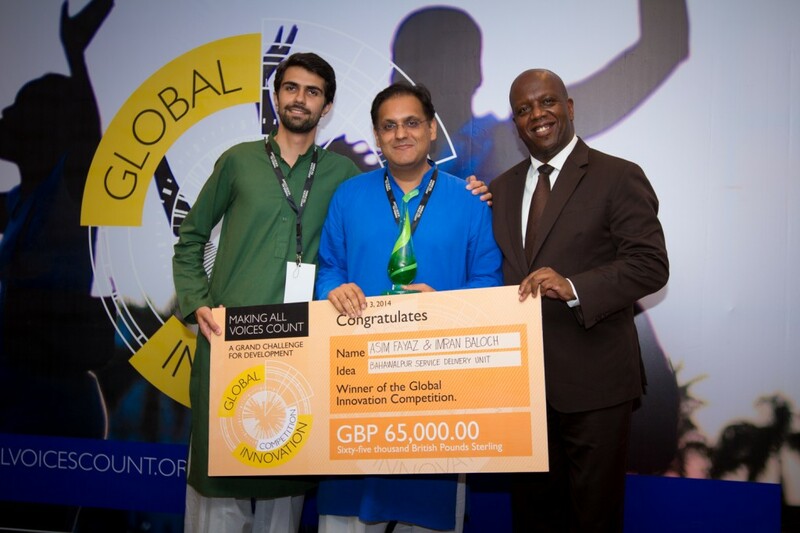 A government driven innovation in Pakistan, digital currency in South Africa and SMS reporting system for maternal health in Indonesia took the top three prizes at Making All Voices Count’s Global Innovation Competition. This competition, launched at the Open Government Partnership, scouted the world for fresh ideas to boost citizen engagement and government accountability. Government driven innovation Bahawalpur Service Delivery Unit (BSDU) emerged as the winner of competition, led by a District’s Chief Executive from Pakistan Imran Baloch and Asim Fayaz fromPakistan. This innovation seeks to improve service delivery in under-resourced, conflict areas with lack of data-driven performance management systems. Making All Voices Count’s Global Innovation Competition was set up to recognize and rewards creative and cutting-edge innovations that enhance government transparency and accountability. A total of 196 entries being submitted and following an online voting system, 31 semi-finalists were drawn from the top 27 voted ideas along with 4 wildcards. The Global Innovation Competition Jury comprised of respected experts in information systems and governance, together with other peers, shortlisted 10 finalists drawn from eight countries: Kenya, Indonesia, South Africa, Pakistan, Ghana, Bangladesh, Tanzania and Mozambique.